Currently viewing the tag: "Contemporary Fiction"
Happy to announce that my book finally made it to #1 on Amazon Bestsellers List today. There’s a lot of great indie-fiction out there, so I’m honored and glad to see that people still like reading long-form. Hoping the fire is well-stoked and that people will continue to buy/share Robin’s Blue while I move on to my next projects. Thanks to all the indie-bloggers who reviewed me, helped with the promotions and invited me for interviews. And thanks to Kim Castle for the gorgeous cover design. Exerpt from Robin’s Blue the Novel. I don’t remember Mommy dying, only the finned taillights of my father’s car pulling away from Nana’s curb, the smell of skinless paprika chicken baking in the kitchen, the chime of a grandfather clock. Fragments: Up, Up and Away by the 5th Dimension, Chanel No. 5, a guitar. Mommy’s death marked the passing of my happiness but since I learned early that people didn’t respond well to gloom, I achieved an astounding ruse of lightheartedness. Saying my mother died of complications due to infectious pneumonia became like saying my name was Robin Elizabeth Daniels. It was my moniker, like being born in Philadelphia, October 25th 1962, like being the skinny, funny one of the two Daniels girls, like having a stepmother who didn’t attendPTA meetings. It wasn’t the grief that fell like a curtain over the face of the recipient of this information, it wasn’t my daily incubus of suffering to bare, it wasn’t my mother, the floating apparition, who haunted my waking hours, because her image faded with each day that passed. Pictures. I have them. Flat perfect squares of color –a diaper clad toddler at the beach, a woman kissing her, holding her with one hand, a bucket in the other, my sister Melanie in the background splashing knee-high in the breakers. Daddy didn’t talk about my mother; he didn’t not talk about her either. She was the pervasive sidestepped presence. Melanie and I only spoke about her in private. For me it was because I didn’t want to bring our desolation out for inspection, but for my sister, I think it was because she kept her grief like a polished trophy for herself and never trusted Daddy to share in it. She involved me in remembrances as a sounding board, not as a confidante, I’m certain. But it wasn’t like Daddy ever referred to Mommy in any of the ways I’d seen in movies or on TV when a mother has died, like “You remind me of her,” or “She lit up every room she entered,” or “She loved the rain.” Instead, she was a constant vaporous tableau, mentioned randomly, thoughtlessly and regrettably at once in the same breath. And I assumed that because Daddy lived instead of Mommy, he loved me unconditionally despite his absence, his anger, and my striking resemblance to the woman who’d forsaken him. Available in Paperback and on Kindle November 1st. 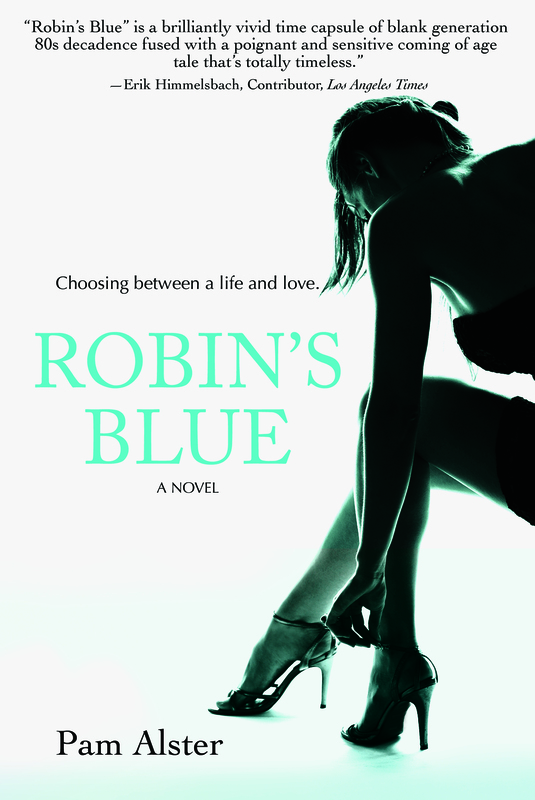 Pam Alster, former stand-up comedienne, Lifetime TV writer & suburban mom brings a decade of living on the dark side to light in her debut novel Robin’s Blue available everywhere November 1st. www.pamalster.com Find her on Facebook and Twitter @plexigirl.